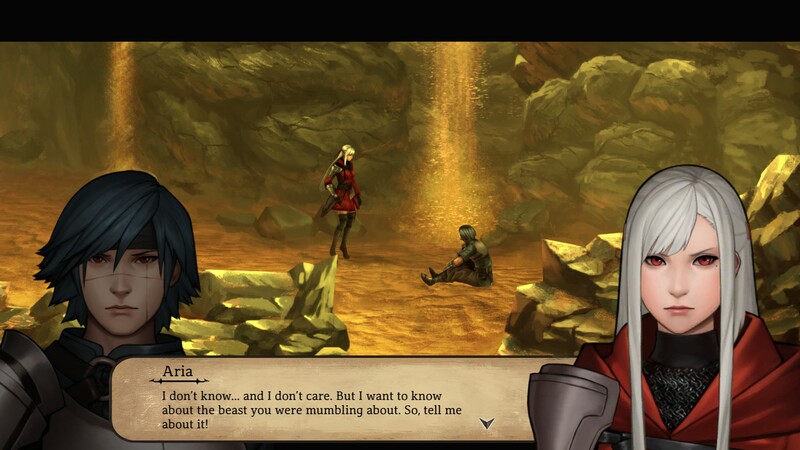 Legrand Legacy is a game where I could’ve sworn I’d heard the name before, but knew nothing about. As it turns out, it’s an RPG for PC developed by Semisoft, and it was funded on Kickstarter with extended crowdfunding having ended at the end of May. 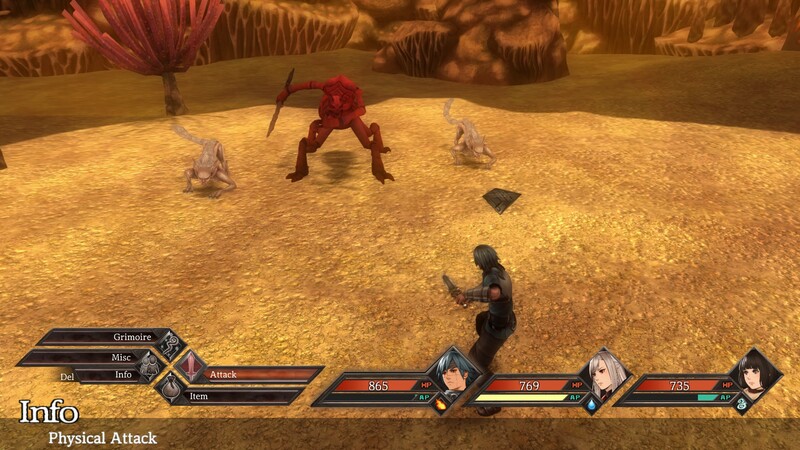 Legrand Legacy is a straightforward turn-based RPG, where you command a party of three characters in combat. Action selection is menu-based, with different action categories – such as attacking, using items, using spells and miscellaneous actions bound to the four cardinal directions on the stick. Selecting any option other than attack opens another similar menu, where you can assign spells (known in-game as “Grimoire”) and items to the four directions, which are the only items and spells available in combat. Once you have four or more party members, you can switch them out freely, without taking a turn. While the random buttons used for the prompts take some getting used to, it reminds me of something you’d see in Super Mario series RPGs, and I like how it adds some variety to the otherwise standard combat. While attacking – or doing anything other than support actions or using items – timed button prompts appear on-screen, dramatically reducing effectiveness if you miss completely or increasing it if you hit the prompt with perfect timing. While these take some getting used to, they generally work fairly well, once you fix a fairly major bug that prevents them from working at all when you first start the game. Fortunately I was able to circumvent it fairly easily, but the fact that it happens every time I start the game is frustrating, and will hopefully be ironed out by the time the game makes it to release. The navigation and visual design in towns and dungeons is very reminiscent of PS1-era Final Fantasy games, with 3D character models moving around a pre-rendered 2D background. However, battles are not random, instead represented as amorphous black blobs with glowing orange faces moving around dungeon maps. Approaching from behind gives you a free turn, and vice versa, as is standard for RPGs that have similar systems. 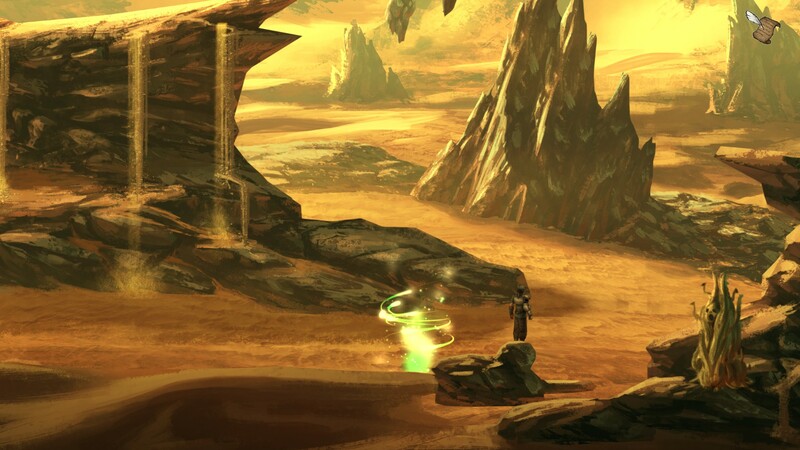 Unfortunately, the visual design works against this mechanic; while the backgrounds are beautiful, they can make it difficult to judge depth and precise location of protagonist Finn and enemies alike. It’s also easy to get stuck on scenery, completely immobilizing you and leaving you open to getting ambushed by enemies near you. The music is nothing special, although it has an interesting middle-eastern flair to match the desert setting, and certain background noises and animations seem like placeholders which will be replaced by higher-quality assets in the future. From a technical perspective, Legrand Legacy is in a good position for a beta to be. It has technical and polish issues – such as the input bug I mentioned above, as well as smaller things like characters’ portraits being replicated in conversations and myriad grammatical errors in conversations. However, the most serious bug I encountered was certain cases where, after having Finn guard and defeating an enemy on the same turn, the combat sequence tends to freeze, with no way to continue the fight. While the game has a solid foundation from a gameplay perspective, the story is where it stumbles a bit. I won’t go into a whole lot of detail, the characters in particular took their time to grow on me, coming across as a mismatched, dysfunctional group that only stays together out of convenience. The difficulty curve is also quite harsh, with forced grinding, limited money with expensive support items, and a healer who doesn’t get a proper healing spell aside from regeneration for several levels. However, it has plenty of promise, and I look forward to seeing what it looks like when it releases later this year.